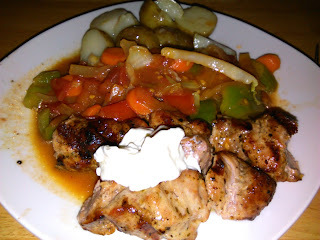 Pork Souvlaki from Mitchell's, it tastes good and it's easy to cook. Usually I use it to slap a meal on the table as quickly as possible but this time I decided to try a little harder. I brushed the pork with oil and BBQ'd it as usual, that was easy. Instead of rice I decided on new potatoes at the last minute. I put them on to boil and that left just the ratatouille. I took a slice of cabbage so it would be like shredded. Two tomatoes diced. Half a green pepper diced. One stick celery diced, a small carrot and an onion diced. I sweated the onion and carrot first. Next went in the green pepper, celery and cabbage. I softened the pepper a bit then sprinkled half a teaspoon of vegetable stock over the pan followed by the same of flour. Stir that a minute to let the flour taste cook off. Then add the tomatoes and an ounce of water. Bring to a simmer and reduce as the tomatoes release water. I put a few sprigs of fresh thyme and one of rosemary in the pan at this point with some salt and mixed pepper. I plated the souvlaki with a dollop of sour cream, that was a nice addition. The ratatouille was wonderful. Fern doesn't usually like a wet plate like that but it tasted so good he just kept slurping it up. The potatoes were a great change from rice and went really well with the ratatouille. It took an extra ten minutes to prep the vegetables but it was worth it. I'll do this again.